This next blogger is the very first person I asked to participate in this series. She also happens to be one of my closest friends (and I met her through blogging!) Victoria from the Manicurator exploded onto the nail art scene in March of 2012 and quickly became a go-to blog for swatches and nail art. She is so meticulous and I love that about her designs. I'm so glad she agreed to participate and I'm even more happy to call her my friend. Thank you, Victoria! Another $10 has been added to my donation to the Polished Girlz for Victoria's beautiful nail art. If this is the first post you've read in the WPP "Blogging for a Cause" Guest Post Series...pop over to the intro post here to see what an amazing organization each of these bloggers are supporting with their participation. Hello work/play/polish readers! What an honor it is to be asked to join this project to benefit the Polished Girlz, an organization that inspires and also shows it takes just one girl with a passion to help create good in the world. I "met" Leslie over a year ago when we both entered a nail art contest hosted by Sarah at Chalkboard Nails. Leslie and I sort of sent congratulations to each other, sure the other would win. Neither she nor I won. LOL But our friendship bloomed and I'm so proud to call Leslie a true friend! 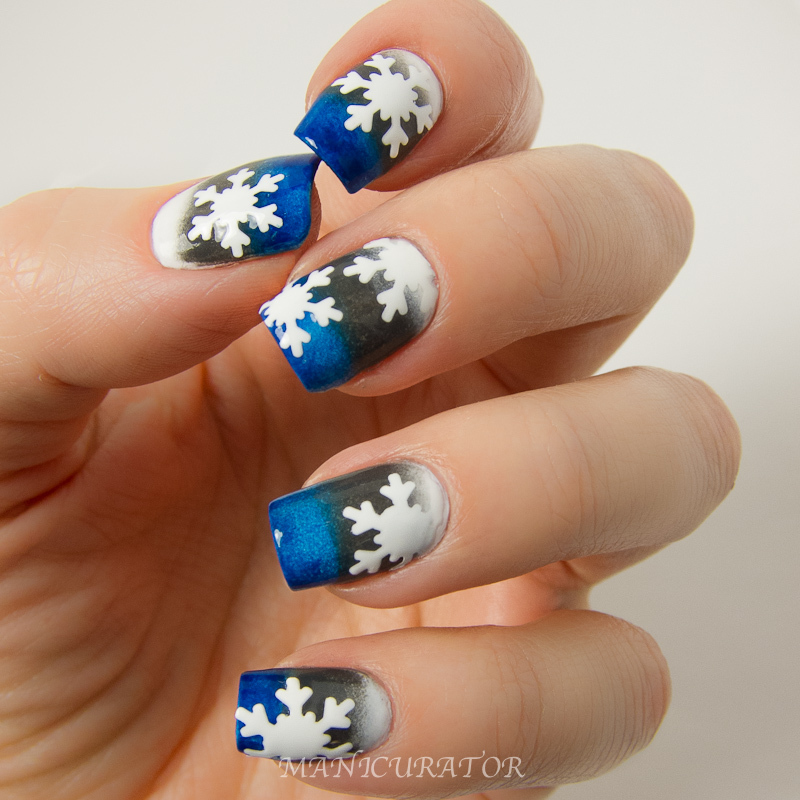 So for this mani, I made my own snowflake decals! My first attempt doing it and I'm hooked! The only trick to this, is you have to know ahead of time so you can prep your polish. By prep, I mean you complete the first step ahead of time.You will need to paint out a swatch of your polish on a non porous surface (I use wax paper) and let completely dry. I used Glitter Gal White Pointer, several coats to get a thick layer and let it thoroughly dry. 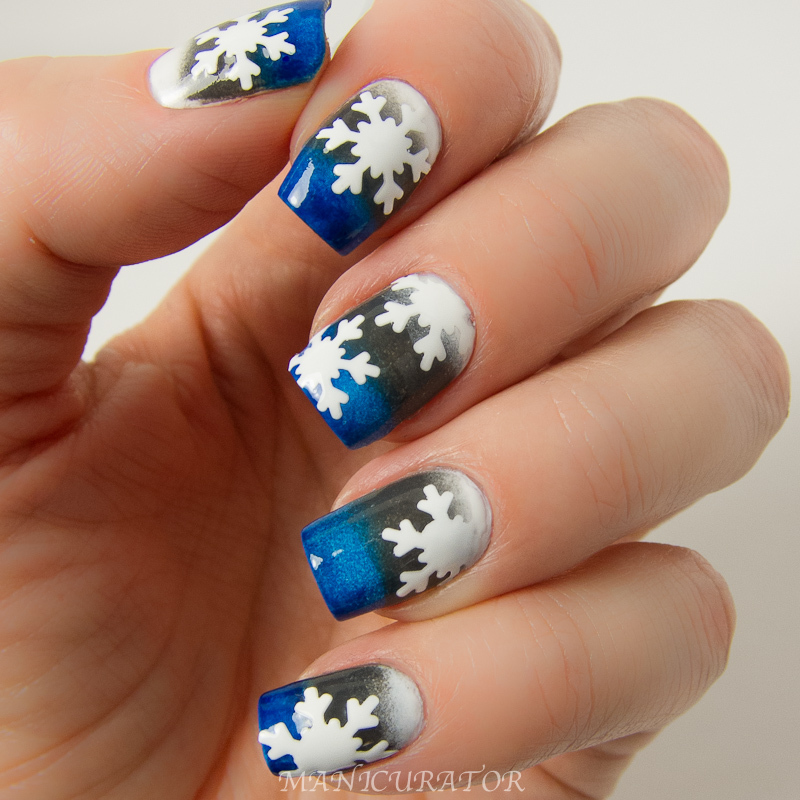 Next step is to peel off the dry polish, then I used a snowflake craft punch to punch out my white polish snowflakes. It worked perfectly! I set them aside and got to work on my nails. Using a base of Glitter Gal White Pointer, I sponged on a gradient with White Pointer, Big Smoke and True Blue Aussie. 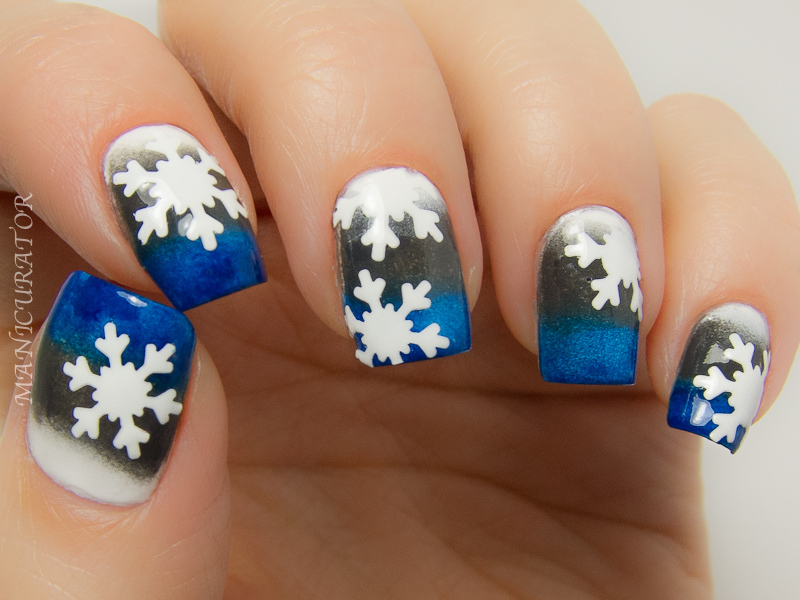 I placed my snowflakes onto my nails and used a clean up brush to clean around the edges, top coat and DONE. I really loved how these turned out and again big thanks to Leslie for asking me to be part of this great cause. You are the best!! Find the Manicurator on the web!